Movies.com > Movie News > The Geek Beat: Are the Sci-fi Movies of the 1950s Better Than Today's? The Geek Beat: Are the Sci-fi Movies of the 1950s Better Than Today's? When we go to the movies looking for a great sci-fi escape today, more often than not it can be hard to sift through the noise, the effects, and the spectacle to find substantive ideas that can challenge our ways of thinking. Today, it's difficult to think of the term "sci-fi" and not automatically conjure up images in your head of films like Star Wars, Avatar or The Matrix as your first stops in thinking about what the genre is. As someone who really appreciates many of those films, it's hard to look at movies coming out like Pacific Rim or Riddick and not think that sci-fi has lost something vitally important: a challenge. Not all of sci-fi is broken, far from it. Entire generations of filmmakers are inspired by both blockbuster sci-fi and plenty of classics, so you're bound to get some great films out of it. 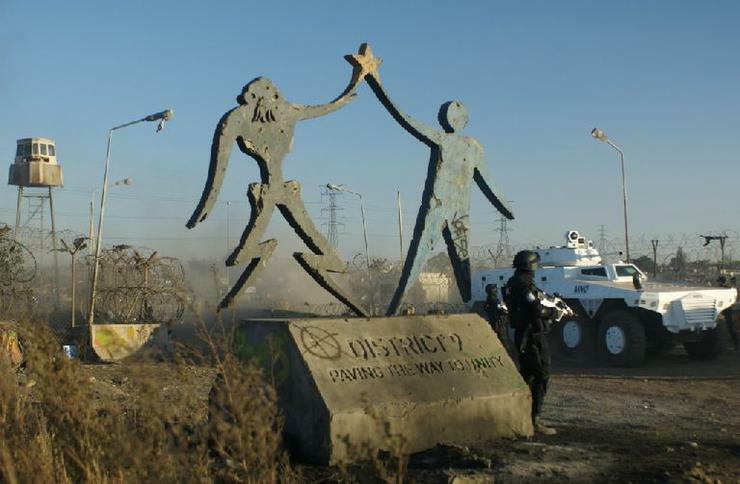 Perhaps the best sci-fi film released in my lifetime is Neill Blomkamp's District 9, which not only had a singular vision for what the world looked like, but also had important ideas it was attempting to convey about a very dark era in South Africa's history. It also had bombacity! If the film was made just a decade earlier, it might be laughable seeing Sharlto Copley's hand morph into a crablike appendage. D9, though, balanced that bombacity in its imagery with a great deal of character and strength, forcing us to feel for that transformation. The sci-fi of the 1950s wasn't as harsh as a film like D9, but that same mentality of presenting a challenging idea through the lens of an impossible situation is something you don't see a great deal of today, especially on "lower" budgets. I'm not trying to make an argument to sound like the old man yelling for the kids to get off the lawn. At age 25, I hope I'm not there yet. I'm also not against blockbuster science fiction films, and am, in fact, greatly looking forward to the likes of Elysium and Pacific Rim. When looking at the films that my dad grew up with, though, and how so much of 1950s sci-fi has shaped the conventions of today's version of the genre, I do feel like a little something has been lost. So, I've identified three things that make science fiction, collectively, a better genre 60 years ago than it is today. Today's science fiction films have a bit of a cookie-cutter mentality to them, where any bombacity the ideas have is really pushed by the visuals more than anything else. Michael Bay's Transformers films, for instance, use their characters from the original toy line and the crazy types of situations that giant robots disguised as cars can permit in order to create as many explosions and frenetic action sequences as possible. This goes a long way in appealing to people who are looking for unadulterated fun, but little else, in their films. 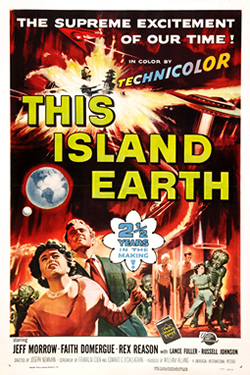 Looking at This Island Earth, a personal mid-'50s sci-fi favorite, the film used its crazy concepts to push forward ideas it wanted to share about humanity, namely those surrounding the threat of nuclear weapons and the dangers of bigotry. Not everyone that looked funny to someone is a bad person, and something that may seem so simple today could actually be interpreted as a challenging notion back in 1955. It didn't really make any concerted effort to fit inside a predetermined mold of other, more "serious" drama for its time, and it largely stands on its own as a solid representation of science fiction found in the 1950s. Not only in theaters, but also comics, early television, and other adventure magazines. The backdrop of space opera was a vehicle to take the film's audience not just to other worlds, but to other thoughts, and that can be a stark contrast to something like a Transformers film. Today, sci-fi seems to cost a lot. Budget estimates on Pacific Rim have placed it as high as $190 million (the same as Star Trek Into Darkness), After Earth was around $130 million, as was last year's Prometheus. The result is that these high-concept sci-fi films are forced into blockbuster territory, where if they don't break box office records within the first week of release, they're already in financial danger. It doesn't need to be this way, and it didn't used to be either. 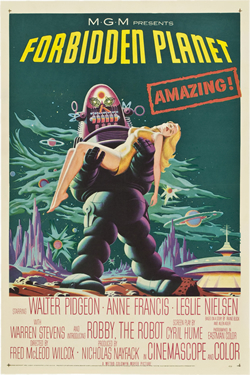 Case in point, one of the most revered and imaginative science fiction films of the 1950s, Forbidden Planet. This was a film that, in many ways, was the Star Wars of its time. Science fiction magnate Gene Roddenberry and even some of the creators of Doctor Who detail that Forbidden Planet was a sizable inspiration on their later work, and by today's standards, it was a film that was made relatively modestly. Its budget was just under $5 million back in 1956, which would roughly translate to about $40 million today. That spurred a film that has been nominated for the American Film Institute's 10 best sci-fi films of all time, and continues to stand as one of the best examples of science fiction during what you might call it's golden age. Its take? $23.5 million, which in today's dollars translates to just over $200 million. Undoubtedly successful, and perhaps even a blockbuster by the time's standards, but the pressure wasn't necessarily on it to perform at record-shattering levels. Another reason I go back to admiration for District 9 is because in addition to its representation of ideas, it actually performed very similarly to Forbidden Planet. On a $30 million budget, D9's take was just about $211 million. With the right vision, this standard is not something from a bygone era! We could still have it today, and get damn good films out of it in the process. When you see a trailer for a forthcoming sci-fi film, what is the predominant thing you see? Rarely is there a trailer for a modern sci-fi movie that is little more than giant action sequences cut together, collision style. In that respect, many sci-fi film trailers share little resemblance to their more cerebral forerunners and look a lot more like you could have John McClane in the lead for a lot of them. Even a film like Prometheus, which isn't necessarily dominated by action, had trailers giving away practically all of the major action scenes. There was a time, though, when great sci-fi wasn't dominated by action as much as it was focused on character. 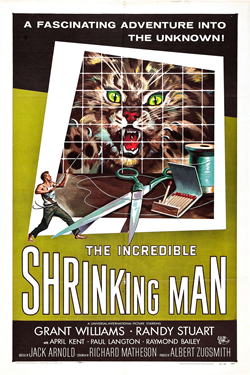 My example, The Incredible Shrinking Man, has some action in it (including a very entertaining fight scene with a house cat, and a few memorable tangles with a spider), but the majority of the film is dominated by a great deal of nuance and poignancy. A rather strange concept was given great service by the performance of actor Grant Williams, who gave it life and helped to put the audience in his ever-shrinking shoes. By today's standards the performances on display may seem a bit hammy, but it's very enjoyable and surprising to see that such truthfulness was given to an idea that relies on the emotions of the audience, and that isn't necessarily driven by action. Those are just a few thoughts. As I said, I don't necessarily dislike what science fiction has become, but in an age of remakes and sequels I'd like to think that there are a few more lessons we can take from the past as we move into the future. Technology has only helped serve to make high-concept visuals easier now than at any other time in cinematic history. Great ideas aren't always commonplace (that's what makes them great), but sometimes, I just don't get the sense that those kinds of ideas are necessarily the biggest interests in the creative teams making sci-fi today. If we can get back to that, even just a little bit, then there's a great deal of potential to restore the genre to some of it's former glory. Continuing the tradition of classic title World's Finest into the New 52 era, this week DC launches the highly anticipated Batman/Superman #1. 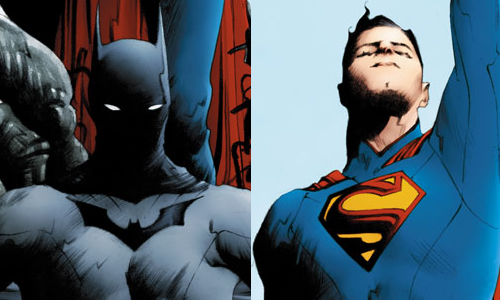 Although readers were left with the impression that the two characters had met for the first time in the first issue of Justice League back in 2011, this apparently isn't the case, as this week's premiere issue will show the true first meeting between the Dark Knight and the Man of Steel before the events of the first League arc. The series is written by Greg Pak (making his DC debut from long runs on the Incredible Hulk and Hercules) with art by Jae Lee (Before Watchmen: Ozymandias, The Dark Tower). Anyone who's at all a fan of both the characters should definitely give it a try, since the creative team include two of the best creators working in comics today, and the first story arc promises to take the two titular characters to some very interesting places (perhaps another Earth?). That does it for this week on the Geek Beat. What do you think about the current state of sci-fi? Is it just fine as is? Does it need to take lessons from an era other than the '50s? Sound off below! Chris Clow is a geek. He is a comic book expert and retailer, and freelance contributor to GeekNation.com, The Huffington Post, Batman-On-Film.com and ModernMythMedia.com. You can find his weekly piece The Geek Beat every Tuesday right here at Movies.com. Check out his blog and follow along on Twitter @ChrisClow.